Finally got back on the water today after a 2 or 3 week break from anything really very fishable. We found hungry salmon….. as in one rod down and already hooked up before the 2nd was ready to go down. A few small ones and a couple over 20 lbs too but we got the 8 we needed in pretty quick order. We even had time to run some fuses to another boater that didn;t have some extras to try and save him the tow in between fish number 6 and 7 and 8. 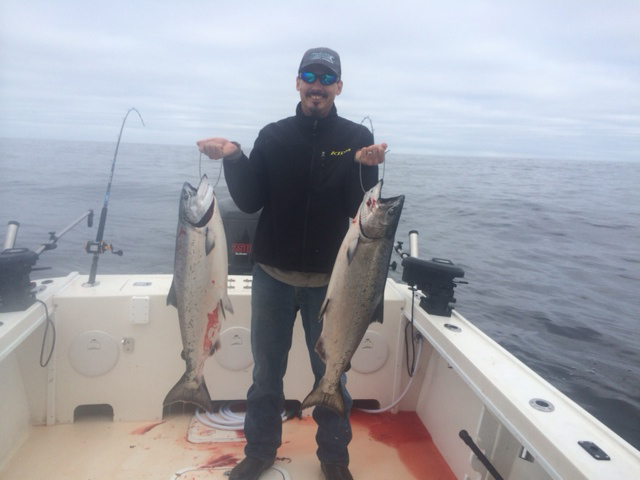 The salmon came from 30-100 ft on the downriggers on bait, apexs and flasher/hoochie in 33 fathoms straight out. The water is salmon brown and the fish were all on one little spot for us. After that we went looking for some halibut to top off the fish box and tried down south in some clear water, then north into the brown water to an area that was great before the blow, and lastly to another waypoint from the past that gave up 2 nice halibut in 20 minutes. We stuck with it and got rewarded. The ocean was beautiful today and got nicer even nicer through the day. 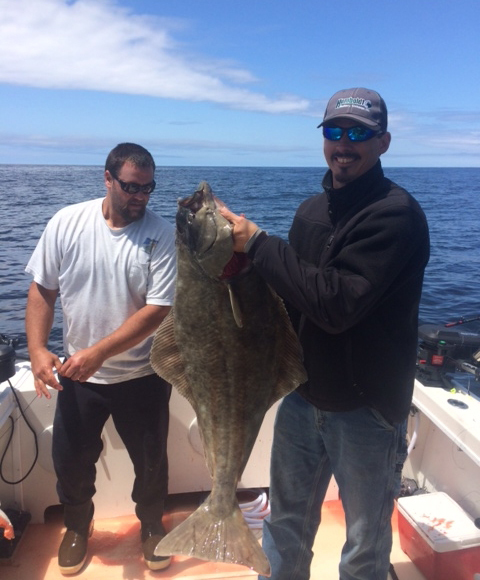 The halibut ate herring and salmon belly on the RCSB Godfather rigs in 49 fathoms a few miles north of the jaws. Back at it again tomorrow for a half day trip and have some room on Mondays half day salmon trip if you want to get out soon.